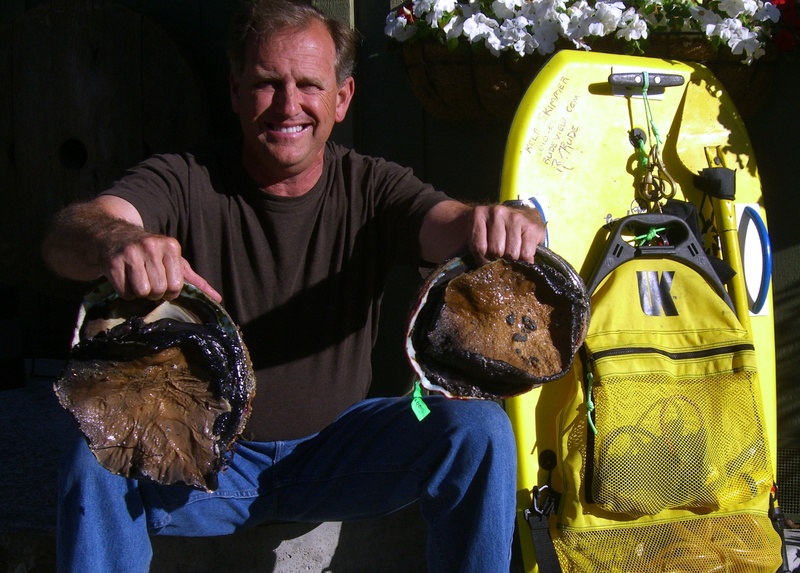 The creation of the “Kelp Skimmer” Abalone Dive Board was the result of years of input from trophy abalone hunters. Each board is custom built. It is designed to be used in conjunction with a “float line” attached to your abalone iron. The board follows you as you dive. The “Kelp Skimmer” tends to slide over the top of kelp with minimal tangling when compared with other dive float devices. Under windy conditions, the profile of the board’s exposure to the wind can be further reduced by flipping it over, placing the bag underwater. This also places any speared fish in the water to stay cool without exposing them to being sampled by a passing seal or sea lion. The “Kelp Skimmer” has a dive bag attached with two compartments, shoulder straps and waist strap for backpacking it to the dive site, a plastic cleat for anchoring, two grab handles on the rails, and several brass clips for attaching gear. The cost of materials to make the Kelp Skimmer is around $100. I will be posting instructions on how to make one and where to get materials in the near future. I no longer make them for sale. Disclaimer: These boards are to be used at your own risk as diving can be very dangerous and I assume no liability for their use. These boards are not safety devices and there is no warranty involved with their use. The user assumes all liability for the use of the “Kelp Skimmer” Dive Board. One of your boards had a 3 ft ab iron, with what looks like a plastic business end. Where can I buy one? The 3′ ab iron (I call it an ab shovel) is made from a floor scrapper you can buy at Home Depot for $30. The head is made out of steel and the handle of fiberglass. You have to flatten the bend out of the blade, then cut off the corners and round off all the sharp edges. Then, cut the handle so that the over all length does not exceed 36″ (I cut mine at 35 1/2″ just to be safe). I then take the rubber grip off of the piece I just cut off, and put it on the shorter handle, drill a hole in the end and attach a brass ring with a zip tie. Use a strong zip tie as this is where you will attach your float line. I spray paint the whole thing yellow for visibility in the water. When you use the “ab shovel”, you do not need to “pry” the ab off of the rock. You merely place the tip of the device between the ab’s shell and the rock, and strike the but of the ab shovel with the palm of your hand. This drives the blade between the rock and the ab, separating him cleanly from the rock. If you can’t reach the ab, you place the shovel on top of the overturned ab and leave it there while you get some air. When you return, the ab will have attached to the shovel and you can just pull him out of the hole or crack. Using this technique, I have never injured or “cut” an abalone while popping him. 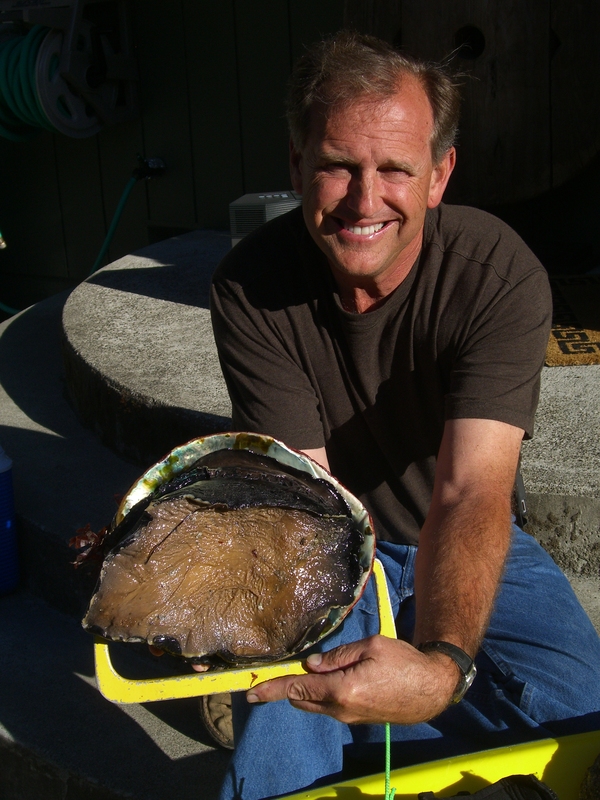 You can gauge the size of the abalone (since it is usually not accessible to measure with a gauge) with the head of the shovel which is 6″ wide at the back. I would like to learn from you mate , where in the US are you ? Im from over Australia & we have some of the most pristine waters anywhere in the world but ive never came across Abs those sizes or even think they grow that big here .. I would also like an Ab Shovel & dive board aswell !! Hi to Willy from down under. I live and dive on the northern coast of California, specifically Sonoma County near Gualala. Your right about the red abalone, they only live in this region and are the largest of the species in the world. I made the ab shovel as well as the dive board. If you click on the link on my page it will take you to a friends website called abalonten at google. 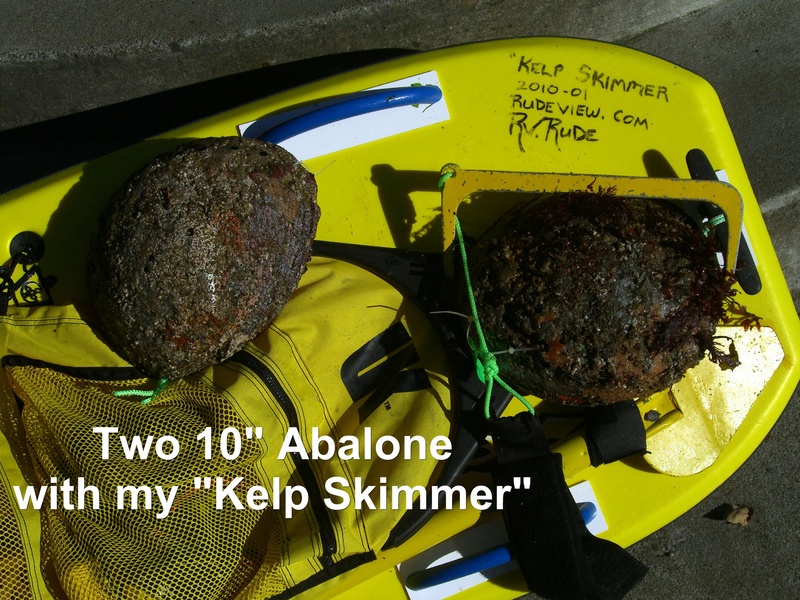 There you will find lots of info on our abalone diving. You can email me directly at: rvrude@hotmail.com for more information. Have fun and dive safe mate! Boards look awesome. Do you have any boards available for pick up this weekend?